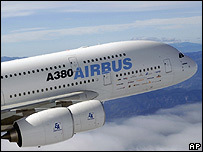 Emirates airline has ordered four more Airbus A380 superjumbos, despite production delays to the project. The decision by the Dubai-based carrier takes its total order for the giant double-decker aircraft to 47. The additional order is worth $1.22bn (£611m) at current catalogue prices. Emirates is due to take delivery of its first A380 in early 2008. Assembly problems with the Airbus jet have led to heavy losses for the European planemaker. Airbus, which is owned by Franco-German defence giant EADS, recently announced 10,000 job cuts across Europe as part of a major restructuring drive. Emirates is Airbus' most important A380 customer, having made the single largest order for the aircraft.